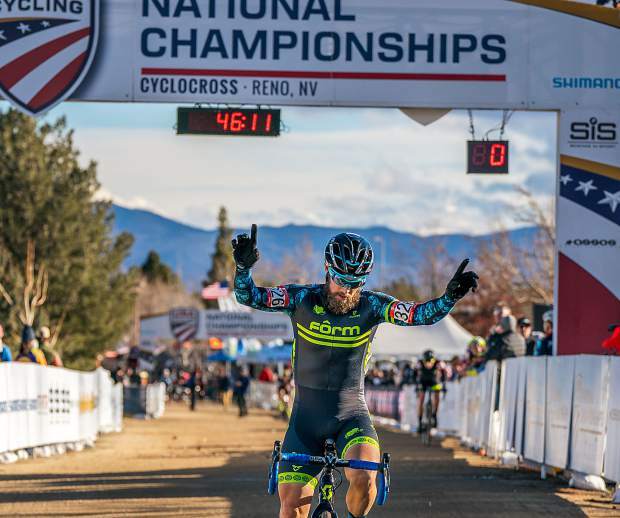 AVON — Local Jake Wells stepped away from the elite competition this year to notch wins in both the single-speed and a masters division race at the 2018 Cyclocross National Championships Jan. 9-11 in Reno, Nevada. Forced to choose between elite and masters level racing, Wells chose masters this year. The 39-year-old’s June birthday puts him into the the 40-44 age division for the 2017-18 season. “I was not taking anything for granted because that category is really strong, there were almost 60 racers in it,” Wells said. At 39, Wells has had the most successful year of his career on his bike. In June, he finished second in the 200-mile Dirty Kanza race against more than 800 other racers and in December he won the Merry Treadmas cyclocross race in Fruita. Wells raced in the masters 35-39 category for a few years until a change in the rules forbid racers from participating in both a masters and elite race at nationals. A win at the masters level had always eluded Wells — he had finished second but never first — so to start his first year in the 40-44 age division with a win came as a welcome surprise. The real surprise, however, came two days later when Wells took down the single speed category, as well, besting a field of 135 racers, some of which would go on to race in the elite division. For the elite race, Wells found himself more focused this year on helping out the junior-level racers at the Denver-based Alpha Bicycle Company team than trying to see where he would place. Wells said the juniors on the Alpha Bicycle Company team are so fast that riding with them before the race likely helped his own performance, as well. Alpha Bicycle Company team members Gage Hecht, of Parker, took fourth in the under-23 division, and Katie Clouse, of Park City, won the 16-17 age division. Hecht and Clouse qualified to participate in the Cyclocross World Championships in the Netherlands as a result of their performances at nationals. Sam Brown of Eagle took 10th in the 16-17 age division. “Sam was expected to take something like 22nd, so we were really psyched to see him do so well,” Wells said.